The Macanudo heritage goes back to l868, when a few Cuban cigar makers who had moved to Jamaica began specializing in fine cigars that would appeal to the British market. 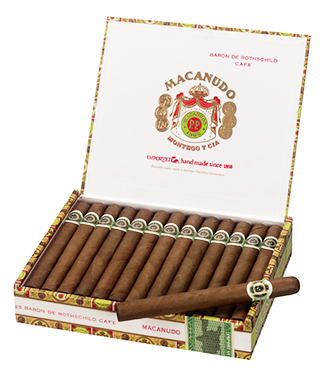 Still crafted by hand in Jamaica, Macanudo quickly became the leading premium cigar brand and remains so today. Produced today in the Dominican Republic, as well as in Jamaica, Macanudos are made with a flavorful Dominican blend and a select binder grown in the rich San Andrés Tuxtla Valley of Mexico. To assure you of the same smoothness in cigar after cigar, the makers of Macanudo spend the time and effort it takes to grow, cure, and age their own Connecticut Shade, the most sought-after tobacco for premium cigar wrappers. In addition, the makers of Macanudo age all of their tobaccos twice, just as it was done in Havana during the golden age of Cuban cigars. The classic natural wrapper Café line offers a very smooth and mild flavor. The Macanudo Maduro adds a sweet Connecticut Broadleaf wrapper, which gives the Maduro version a bit more flavor and complexity than its Café counterpart.